South African President Thabo Mbeki has dismissed his deputy, Jacob Zuma. 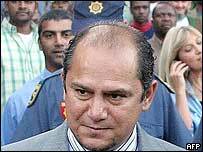 The dramatic move came after the trial of Mr Zuma's financial adviser, Schabir Shaik, appeared to implicate the deputy president in corruption. Mr Mbeki said that in the light of the need to defend South Africa's young democracy, "it would be best to release Jacob Zuma from his responsibilities". Mr Zuma was once seen as the heir apparent to the presidency, and remains a popular figure. Addressing a special sitting of parliament, Mr Mbeki emphasised that Mr Zuma must be presumed innocent, and that Mr Shaik's conviction could yet be overturned on appeal. But he concluded: "In the interest of the honourable deputy president, the government, our young democratic system and our country, it would be best to release the honourable Jacob Zuma from his responsibilities as deputy president of the republic and member of the cabinet." Mr Zuma said he accepted and respected Mr Mbeki's pronouncement. "I believe he has taken this decision not because he believes I am guilty of any crime but because of considerations relating to the constraints within which government operates," Mr Zuma said. Tony Leon, leader of the opposition Democratic Alliance, immediately praised Mr Mbeki for upholding "principle over politics", a sentiment that was echoed by other opposition parties. The governing ANC issued a statement within minutes of the announcement, supporting Mr Mbeki's decision. "The ANC reaffirms that the deputy president and the entire leadership of the alliance [the ANC, South African Communist Party, and trade unions] accept and support the decision of the president," the statement said. Former president Nelson Mandela said that while he was "deeply saddened that [Zuma] who played such a major contribution in our liberation and democracy had to come to this point in his life and career, we fully support the president in the difficult times in the life of our government, nation and organisation." The ANC and its allies nevertheless remain deeply divided over the issue. "I'm devastated and my heart goes out for the deputy president, his family and his colleagues," said Zwelinzima Vavi, secretary-general of the Congress of South African Trade Unions. In the past week, Mr Zuma's supporters in the trade union movement and the Youth League of the ANC have rallied in his support. 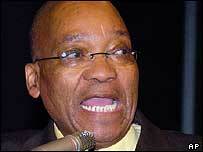 Mr Zuma himself has frequently protested his innocence, and said he has been tried by the media. He is still deputy president of the ANC. Opposition parties and the media had demanded that the deputy president resign, or respond to the questions raised during the Shaik trial. In making a decision on Mr Zuma's future, Mr Mbeki had to weigh the deputy president's popularity against the need to be seen to be acting against corruption. Shaik was convicted of corruption and fraud two weeks ago, and sentenced last week to an effective 15 years' imprisonment. The corruption charges against him involved his dealings with Mr Zuma, and the court found that Mr Shaik had had a "mutually beneficial symbiosis" with the deputy president. Mr Shaik's trial stemmed from an earlier investigation into a South African government arms deal, in which the then chief prosecutor said there was prima facie evidence against Mr Zuma, but decided there was not sufficient evidence to convict the deputy president. Following the Shaik verdict, the National Prosecuting Authority is reported once again to be investigating charges against Mr Zuma. What next for South African politics?